"In Soldiering for Freedom, a recent installment in its publisher's "How Things Worked" series, independent scholar Bob Luke and historian John D. Smith (Univ. 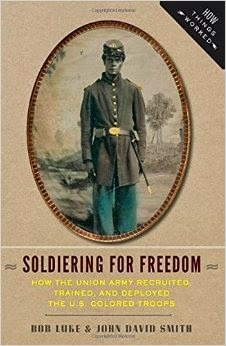 of North Carolina–Charlotte) attempt not to break new ground, but to familiarize a wide readership with the findings of current scholarship on black soldiers in the Union Army. For the most part, their succinct book admirably achieves this aim." "The prologue to the volume wisely begins with the assault of the all-black 54th Massachusetts Volunteer Regiment on Fort Wagner, South Carolina, in July 1863. This action is well known to filmgoers from the acclaimed 1989 movie Glory. The book's five chapters then branch out to provide a wider introduction to the service of blacks in the Civil War."